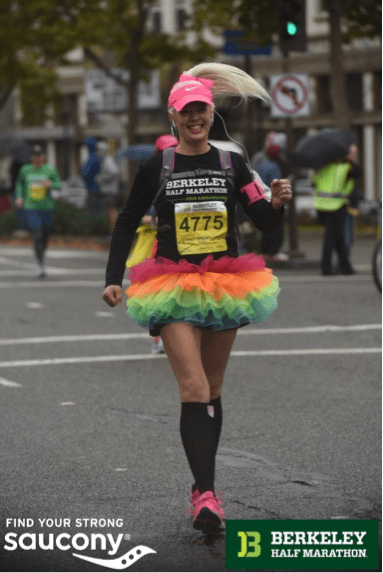 What is the Berkeley Half Marathon – San Francisco Marathon Challenge you ask? 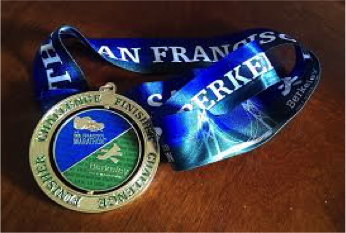 We challenge you to consecutively run any distance of The San Francisco Marathon and any distance of The Berkeley Half Marathon and earn a FREE, exclusive commemorative second medal at the finish line. Say what? A second medal? THAT’S WHAT I’M TALKIN’ ABOUT! Our super high-tech computers will recognize your awesomeness during the registration process. If you register and complete both races consecutively (any distance, any order) with an official finish time, then VOILA! You will get the stamp of approval – literally – on your bib. This incredible stamp announces to the world that you are deemed worthy of receiving the most incredible challenge medal in addition to your finish line medal. After exiting the finish line chute, the smiling volunteers at the Challenge booth with bestow you with this commemorative award around your sweaty neck. Just to be clear, I did say “any distance” for either race. That means 5K, 10K, Half, Full… Any distance, run consecutively, in any order – Berkeley then San Francisco, or San Francisco then Berkeley). This sounds amazing, but why exactly should I do this? Maintain your training. You’ve worked so hard to keep those toned legs moving, so why stop now? It’s easier to keep up your good habits of working out with a regular routine than having to stop and start all over again. Having an upcoming race in the horizon will help motivate you to hit the streets. Holidays are around the corner! Fall and winter bring carbo-licious “feel good” meals to the forefront, and it’s easy to cozy up and pack on the pounds. Running races like the San Francisco Marathon and the Berkeley Half Marathon back to back can keep our eyes on the prize of maintaining good health. Hip and entertaining course. Daily runs in my neighborhood are full of suburban manicured lawns and mini-vans. Boring! There is nothing like an exciting course to make the miles tick by faster. From historic Telegraph Ave to the views from North Berkeley St, the race course shows you all that Berkeley has to offer. The waterfront and bridge views will surprise and delight you, and the Berkeley residents will cheer and support you. Sleeping in. A little-known fact about the Berkeley Half Marathon is that it starts at 8:00am, the 10K 9:00am and 5K at 9:15am. That’s practically in the afternoon for us runners that are used to getting up early for practice runs! How fun is that? You can make a weekend out of the race and stay up (relatively) late the night before to enjoy Berkeley. Now don’t have too much fun and miss the race, now. There will be beer at the finish line festival! Bling, baby! Who doesn’t want to walk around the finish line festival wearing not one, but TWO medals? Hellloooooo? Um, Me! Having two medals around your neck makes you feel like perhaps you won the entire race. The commemorative challenge medal doesn’t even cost extra. You will be a rock-star racer with two medals!